Click image to view & print the programme. Plans are well developed for our 2019 sail and social programme. This year we are expecting several more boats participating. Don't delay get your boat on the water. Highlights this year to include an invite to the International Mersey River Festival as a participating organisation. The Conwy River Festival with race/rally on two days and an invite to join them on their famous 'La La' weekend. Then off to Peel on the IOM before returning back to our homeports via Ardglass/Newry, in Northern Ireland. Our two social weekends are to be arranged, one after Easter, to be advised, followed by our traditional autumn event brought forward to October as a means to ensure that 'things' are still open. 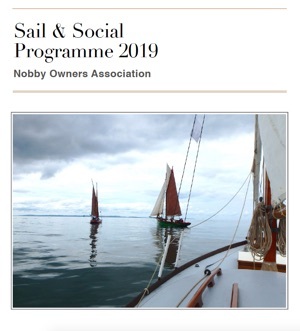 Check out the sail and social programme, by using the link below, to ensure your diary has those key dates for what should be another great year ahead.